crane work and the hire of construction equipment. occupational health and safety according to ČSN OHSAS 18001:2007. Our aim is the continuous improvement of our services for our customers. We have therefore improved our management system in accordance with the requirements of internationally recognised standards in the fields of quality, the environment and occupational safety. In 2004, we prepared comprehensive Integrated Management System (ISM) documentation in accordance with ČSN ISO 9001, 14001 and 18001 standard requirements. This documentation was fully implemented within the activities of APB - PILSEN a.s. The certificates were subsequently approved by Lloyd’s Register Quality Assurance. Our quality, environment and OHS management system documents are based on a full description and the understanding of all processes within the company, and their use for integrated and transparent management within each area of activity. Every employee is required to be aware of the IMS section relating to his position, and to undertake his work in accordance with the approved documented methods, which are expressed in directives and instructions and are in addition to the IMS manual. The relevant descriptions are in accordance with other documentation of a technical nature. Employees are rigorously trained in all IMS fields both on beginning work and at regular intervals. In addition, every employee can suggest steps to be made when they discover a need to qualitatively change the documented methods. Our integrated system is continuously renewed and improved. 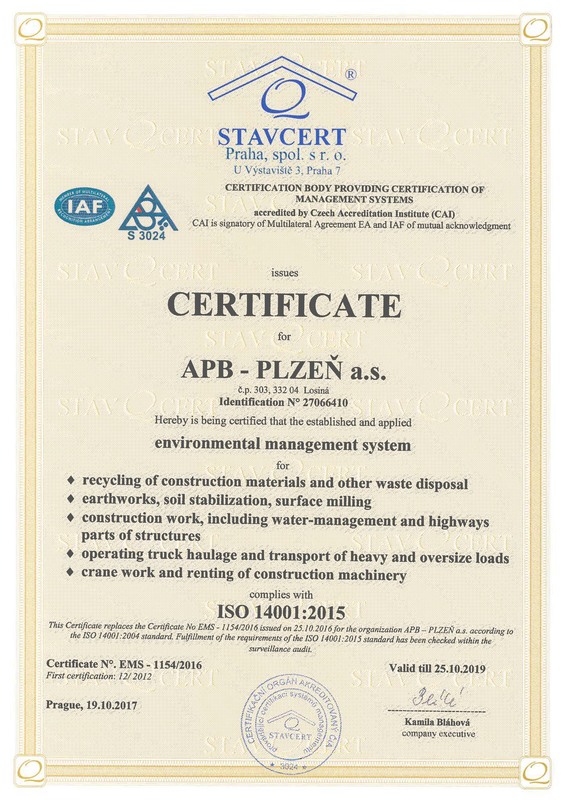 It is regularly checked by APB - PILSEN a.s. internal audits and audits by certified companies which extend the validity of the approved certificates. Audits by our company and certified external companies have found absolutely no disagreement with the wording of the standards or legislative requirements over the whole period since 2004 which would cease their validity. In addition, no checks by state bodies, nor by the supplier audits of our customers, have discovered any disagreement with the wording of the standards, laws, directives or government decrees. 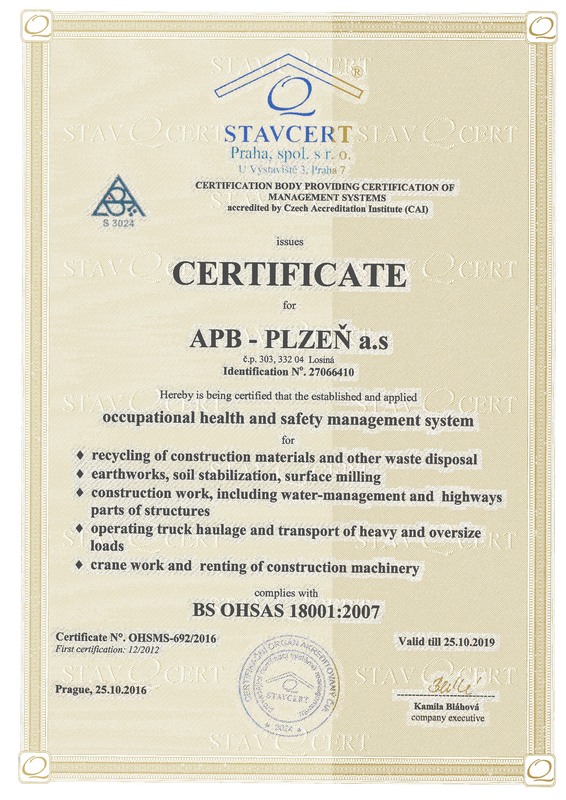 Certificates are approved for a three-year period, so in November 2007, 2010, 2013, 2016 and 2017 successful recertification took place, and we continue to be entitled to use our quality, environment and occupational safety certificates for a further three-year period. 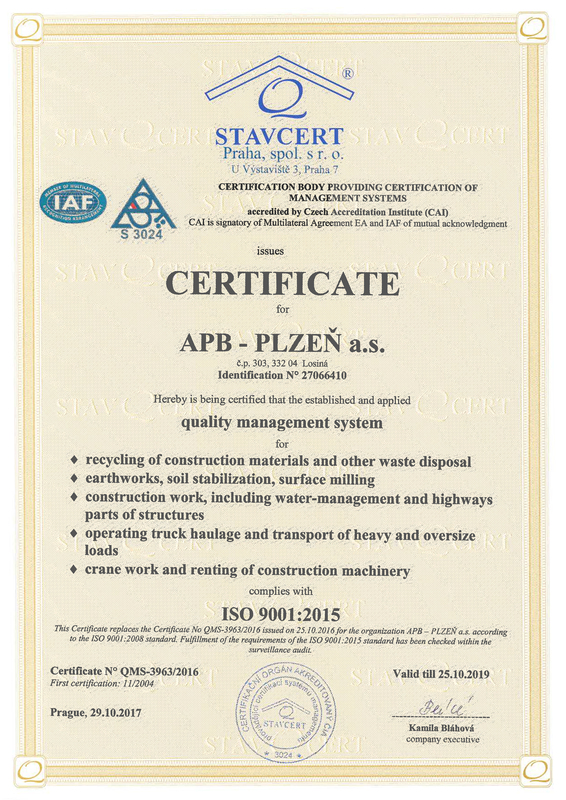 Following a six-year period of successful co-operation with LRQA (Lloyd’s Register Quality Assurance), a new certification company, STAVCERT Praha spol. s r.o. was chosen for our second recertification audit.